Cast: George Clooney, Tilda Swinton, Tom Wilkinson, Sydney Pollack. Story: Lawyer defends weedkiller manufacturer who's gone doolally. I would never have bothered with Michael Clayton had it not been nominated for Best Picture. Glad I did now, because it holds its head up high among the other nominees. They're all very similar, this year's nominees. They're all slow-burners, they're all character- and script-led and there's barely a car chase between them. Mind you, I suppose that's not all that unusual, but this year's contenders do seem rather more closely related than usual. Michael Clayton has picked up all the big nominations - Best Picture, Best Director, Best Original Screenplay and nominations for all three main players - George Clooney, Tilda Swinton and Tom Wilkinson, and it's bound to win at least one of them. Curiously though, it doesn't stand out in any one of those areas in particular, rather it's uniformly high quality throughout, which is a pretty good achievement since director Tony Gilroy is a screenwriter (e.g. all the Bournes) who's never directed a movie before. I haven't mentioned the story yet, have I? Well as usual you don't want to know very much beforehand. 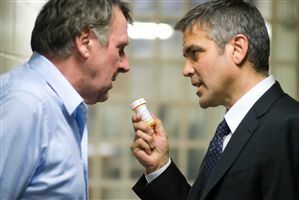 George Clooney is Clayton, "The Fixer," a highly successful lawyer who specialises in "tricky" situations, such as Tom Wilkinson's descent into fruitcakeness during the prolonged trial of his weedkiller manufacturing business. In truth, there aren't as many twists and turns as you might expect from a movie like this, but it really doesn't need them, because the trio of central performances would prop up any script. Well, maybe not Why Did I Get Married, they're not gods. The quality of the stars helps us to concentrate - and that helps, because we're treated like adults and expected to pay attention. If you're prone to drifting like I am, you might misinterpret the odd moment or two - but it won't really matter if you do. What you might have a problem with is remembering the movie a few years down the line, because the one thing it could benefit from is an injection of character, of a signature look and feel. It's too similar to a million other lawyer-centric movies and so will become assimilated into the movie-memory morass. Michael Clayton is an extremely high quality movie that is arguably the best possible realisation of the story. You'll like it, I guarantee it, you just won't remember it. Testosterone Satisfaction Rating: 0/5 - As with all the Oscar maybe's, adrenaline junkies need to look elsewhere. To enjoy this film you should: like George in talkie mode - e.g. Good Night, and Good Luck. Michael Clayton was released in the UK on 28th September 2007.